Project partners Audi, E.ON, the Munich municipal utility company Stadtwerke München (SWM) and the Technical University of Munich (TUM) today sounded the starting gun for a fleet trial with electric cars in the Munich model region. 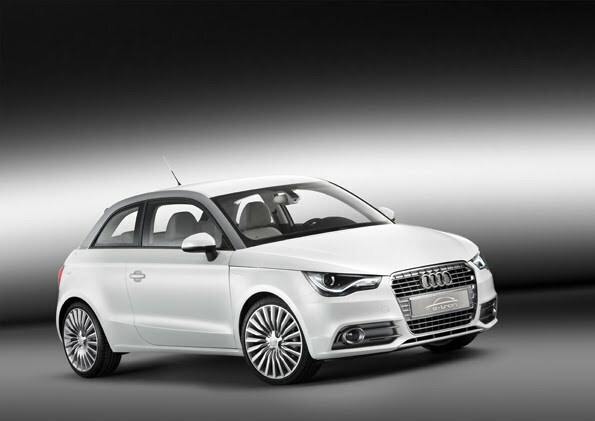 By the middle of next year, 20 Audi A1 e-tron models will successively take to the region's roads and around 200 new charging stations will be installed. The "eflott" project is part of the "Model Region Electromobility Munich" sponsored by the German Federal Ministry of Transport. It will address a number of issues from the data transfer between the driver, vehicle and electric filling station to the power grid. It will also include a test of smartphones as the central interface for the driver. The Audi A1 e-tron is an innovative Mega City Vehicle (MCV) with an electric drive. It has a range of more than 50 kilometers in city traffic and a peak power output of 75 kW (102 hp). A compact internal combustion engine recharges the battery when its energy is depleted. Top speed is 130 km/h (80.78 mph). The compact MCV is a zero-emissions vehicle for the first 50 kilometers (31.07 miles) that it is underway, such as in city traffic. The battery comprises a package of lithium-ion modules mounted in the floor assembly in front of the rear axle. A small, single-rotor Wankel engine in this near-series vehicle increases the range in exceptional circumstances. This “range extender” powers a generator that produces 15 kW of charging power. 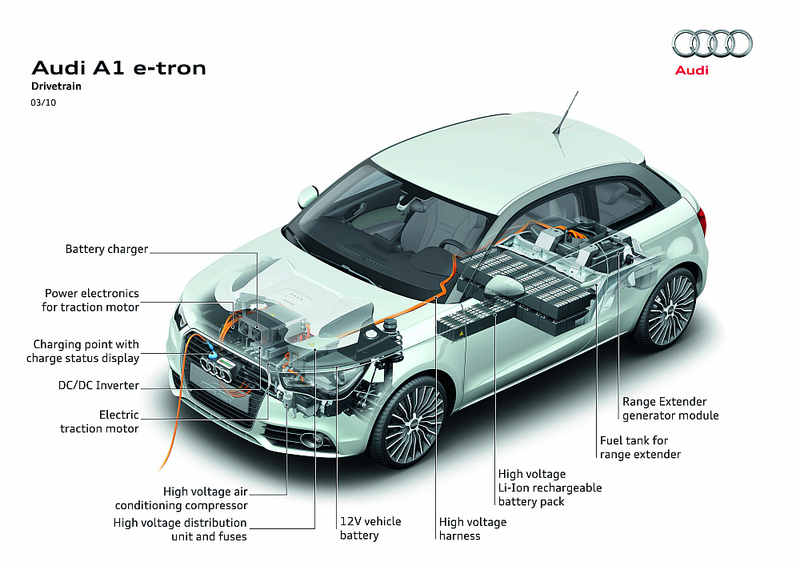 If the range extender is used to recharge the battery, the A1 e-tron can cover an additional 200 kilometers (124.27 miles) of range. According to a draft standard for the computation of fuel consumption for range extender vehicles, this represents a fuel consumption of 1.9 l/100 km (123.80 mpg) – a CO2 equivalent of only 45 g/km (72.42 g/mile). E.ON and SWM are installing the necessary charging infrastructure; E.ON primarily in the outlying areas and SWM in the Bavarian state capital. The two utility companies are initially installing a total of 100 “electric filling stations” each as part of a variety of projects. All of the charging stations are supplied with electricity generated from renewable energies. The Technical University of Munich is responsible for comprehensive data collection and evaluation of mobility behavior. How heavily and in which situation is the electric car being used? And what influence does this option have on the use of other means of transportation? To answer these questions, the Department of Vehicle Engineering has developed a mobile application that will be provided on a smartphone to all participants of the fleet trial. The device will thoroughly document their mobility behavior – from their use of bicycles to the electric cars and from conventional cars to buses and trains. To ensure that the participants always use the smartphone, the Department of Ergonomics made sure that the application features an easy-to-use design that encourages use over the long-term. At the same time, the Department of Marketing is conducting a study to discover which billing models for the electricity used for e-mobility meet with the greatest acceptance. The fleet trial is being supported by the German Federal Ministry of Transport as part of a publically-funded project. “Electromobility is not an abstract technology issue. At its core is the question of how the transportation systems of the future should look. We are therefore funding electromobility under real-world conditions in our model regions – a large field test, so to speak. Projects like these provide us with important insight into how to make electromobility a success, both in the city and in rural areas. In the Munich model region, we are providing approximately €10 million in funding for electromobility. This money is a smart investment in the future. Our goal is clear: We want to make Germany the lead market for electromobility and put at least one million electric vehicles on German roads by 2020,” says Federal Transport Minister Peter Ramsauer. “Audi is working hard on the future of mobility. “We are trying to find a concept that requires no compromises,” says Rupert Stadler, Chairman of the Board of Management of AUDI AG, who continues, “Electromobility means more to us than just electrifying conventional cars. Instead we are dedicated to a holistic approach to all aspects of the topic. We hope that this fleet trial will enable us to gain broad insights into the behavior but also the expectations of our customers regarding their dealings with electric cars. Of course, the data that we will collect are another aspect. This market and technology feedback will enable us to further expand our expertise in electrification. Klaus-Dieter Maubach, Member of the Board of Management of E.ON AG, Technology, adds, “In this project, we are shifting the locations of our electric filling stations to existing parking lots as was suggested by our knowledge of user behavior. We are equipping private garages or parking garages, for example, with charging stations. We hope that this will allow us to further develop the technology of the charging points and the communication with the grid operator, in particular, and thus secure our leadership role in the development of electric filling stations. Intelligent charging points are more than just electric filling stations. They are the prerequisite for using vehicle batteries as intermediate storage for renewable energies in the intelligent power grids of the future.